A nutritious member of the citrus family, grapefruits are large, tart and tangy fruits known primarily for their vitamin C content. The fruit, often mistaken for a pomelo, can be found with either white, pink, or red pulps – all with different levels of sweetness while offering very similar benefits. The best part? While grapefruits are normally in season from winter through early spring, you can experience the health benefits of grapefruit all year round. Here is what the fruit has to offer. As you may already know, grapefruits are well-known for their high vitamin C content, but the fruit certainly has more to offer. In addition to being rich in vitamin C, grapefruits also rich in Vitamin A, fiber, and potassium. Here is a more complete (but not fully complete) nutritional profile of grapefruits, outlining the key essential nutrients. Figures are based on a 1/2 serving of grapefruit (you can simply double the amount of each vitamin, mineral, and nutrient, as well as each RDA, for nutritional content of a full grapefruit). Vitamin C – 38.4 milligrams. 64% RDA. Vitamin A – 1415 IU. 28% RDA. Thiamin – 0.1 milligrams. 4% RDA. Folate – 16 micrograms. 4% RDA. Potassium – 166 milligrams. 5% RDA. Fiber – 2 grams. 8% RDA. Vitamin B6 – 0.1 milligrams. 3% RDA. Magnesium – 11.1 milligrams. 3% RDA. Check out the USDA Nutrient Database for a full nutritional profile of grapefruit. Seeing as grapefruits are rich in essential vitamins and minerals, there is no doubt that the fruit can provide numerous health benefits. Below you will learn about at least 10 grapefruit health benefits that you can share with your friends and family. Ever hear of the grapefruit diet? Also known as the Hollywood Diet, the grapefruit has has been around for decades, and apparently holds some merit. One 12-week study led by Dr. Ken Fujioka found that including grapefruit or grapefruit juice into your daily diet does indeed boost weight loss. For the study, 100 participants were separated into 3 groups with varying grapefruit and grapefruit juice intake levels. In the end, participants who ate 1/2 grapefruit with each meal lost 3.6 pounds on average while those drinking grapefruit juice 3 times daily lost 3.3 pounds on average. In many cases, more than 10 pounds was lost. Further adding to the health benefits of grapefruit, some studies have also found that the fruit contains compounds responsible for boosting heart health and reducing heart disease risk. One study, published in the Journal of Agricultural and Food Chemistry, discovered compounds found in red and blond grapefruit were able to lower blood cholesterol levels in as little as one month. The research was performed on 57 patients who had had coronary bypass surgery. Some research, published in the Journal of Nutritional Biochemistry, set out to discover if naringenin, a flavonoid concentrated in grapefruit, encourages DNA repair following oxidative damage in LNCaP human prostate cancer cells. After exposing cell cultures to the compound, the researchers found that naringenin helps DNA to repair by inducing two DNA-mending enzymes during the replication stage. In addition to naringenin protecting DNA, vitamin C is essential for preventing free radical damage. The vitamin C content and phytonutrients found in grapefruit help to prevent a number of issues related to DNA damage and oxidative stress, including: osteoarthritis, rheumatoid arthritis, asthma, and cancer growth. Finally, grapefruit juice has been shown to protect against colon cancer when consumed 3 times daily at 6 ounces for each serving. The research, presented at the 228th National Meeting of the American Chemical Society, found that grapefruit, along with isolated compounds found in grapefruit (apigenin, hesperidin, limonin, naringin, naringenin, and nobiletin), ignite the death of cancer cells and even increases production of healthy colon cells. This may be one of the most intriguing health benefits of grapefruit. 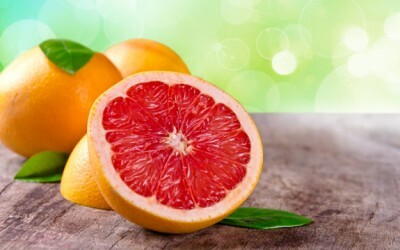 Liver Cleansing, Detoxifcation – Grapefruit contains numerous liver-cleansing agents. Among them are vitamin C, various antioxidants, and phytonutrients called limonoids that helps toxic compounds to excrete from the liver by making them more water soluble. The fruit also contains a flavonoid compound known as naringenin, as mentioned earlier, which causes the liver to burn fat rather than store it. Helps Treat Gum Disease – According to a study published in the British Dental Journal, consuming 2 grapefruits each day for two weeks results in significantly less bleeding of the gums. Grapefruits were shown to drastically increase plasma vitamin C levels and help manage periodontal disease. Helping with Respiratory Issues, Asthma – In case you didn’t know, vitamin C has been shown in numerous studies to lessen respiratory issues and prevent asthma. One study published in the journal Thorax found that consuming vitamin C-rich fruit reduced wheezing symptoms in children while also aiding asthma, chronic cough, shortness of breath, and even runny nose. Boosting the Immune System, Preventing Colds – Along with containing high amounts of vitamin A, potassium, folate, and thiamin, grapefruits contain one of the most well known vitamins for boosting immunity and lessening the duration of colds or sickness – vitamin C.
Preventing Kidney Stones – A study published in the British Journal of Nutrition found that women drinking 1/2-1 liter of grapefruit, apple, or orange juice daily reduced their risk of developing kidney stones. The juices work to increase urinary pH and hasten the rate at which citric acid is excreted, which reduces the risk of calcium oxalate stones forming. Promoting a Healthy Pregnancy – Rich in folate and vitamin C, grapefruits can be great for promoting a healthy pregnancy. Vitamin C works to promote proper bone growth, bone development tissue repair, and helps to maintain cell strength in the womb. Folate, an extremely important B vitamin for pregnant mothers, helps prevent birth defects like spina bifida and helps the baby to grow sufficiently. Did you have any idea the health benefits of grapefruit could be so great? As a side benefit unrelated to health, you could also use grapefruits for cleaning! Dip the extra pulp left over from juicing the grapefruit in some sea salt and run it over fixtures in your bathroom or kitchen while squeezing out leftover juice. Citric acid works to eliminate dirt while salt disinfects. Rinse after scrubbing. If you are taking medication, be sure to check with your doctor before eating grapefruit or drinking grapefruit juice, as many medications mix badly with the fruit. Grapefruits contain compounds known as furanocoumarins, which are known to spark a negative outcome when combined with many medications – at least 44 medications, in fact. What’s worse, some of these medications could lead to sudden death. Some common medications in this mix are cholesterol drugs like Lovastatin, Lipitor, and a heart disease medication called Amlodipine. Check here for a longer list of medications that shouldn’t be taken with grapefruit juice. After that, learn how you can replace the medication with natural solutions. Now you can truly enjoy the many health benefits of grapefruit!